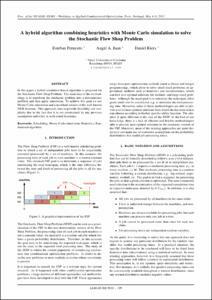 Juan, A.; Peruyero, E.; Riera, D.
In this paper a hybrid simulation-based algorithm is proposed for the Stochastic Flow Shop Problem. The main idea of the methodology is to transform the stochastic problem into a deterministic problem and then apply simulation. To achieve this goal we use Monte Carlo simulation and a modified version of the well-known NEH heuristic. This approach aims to provide flexibility and simplicity due to the fact that it is not constrained by any previous assumption and relies in well-tested heuristics. Juan, A.; Peruyero, E.; Riera, D. A hybrid algorithm combining heuristics with Monte Carlo simulation for solving the Stochastic Flow Shop Problem. A: ALIO/EURO Workshop on Applied Combinatorial Optimization. "Proceedings of the VII ALIO/EURO Workshop on Applied Combinatorial Optimization". Porto: 2011, p. 129-132.